Looking slightly west of northwest from Mount Sheogorath. In the near ground, center is the eastern exit from Dunroot Burrow, and the peak in the center-left is its western entrance. The ruins in the distant top-left are Milchar, and the main body of water visible separates the main region of Mania from Saints Watch. Mania is the northern half of the Shivering Isles. It represents the creative side of Sheogorath's madness, and tends to have overly bright colors, as opposed to the unnaturally dark colors of Dementia. The main town in Mania, and the only one which provides any services, is Bliss, which has an Inn and Blacksmith. The residents of Mania tend to be less gloomy and depressed than those of Dementia, but their bright nature can often shield a deadly aspect. Order is kept by Golden Saints, who fulfill the same functions as guards in Cyrodiil and the Dark Seducers in Dementia. 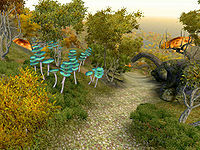 Mania contains examples of all creatures living in the Shivering Isles, with the exception of the Dark Seducers, who are specific to Dementia. Some creatures, however, such as the Elytra, appear different from their Dementia counterparts. 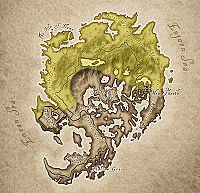 The Isle of Flame - Large island in Northern Mania that houses Cylarne. The Jester's Spine Mountains - Mountain chain in the northeast running from Saints Watch to New Sheoth. 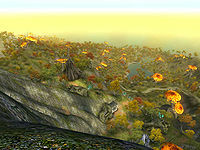 The Laughing Coast - The northwestern coast of The Shivering Isles. Saints Watch - A peninsula at the northern tip of The Shivering Isles. A list of places in Mania can be found here. Taxonomy of Obsession: Help a Dunmer finish her research. The Great Divide: Resolve the "trouble of doubles". This page was last modified on 12 February 2014, at 23:13.